Short answer yes, the body is an intrinsically interconnected organism, that needs to be treated as whole in order to receive maximum benefit from self-care practices we need to see it as such. Let’s take our quest to take our skin care to the next level by doing a little research on the lip area and look at why and how we can create a medicinal treasure chest of plant allies to assist us in the maintenance of some very vital areas. 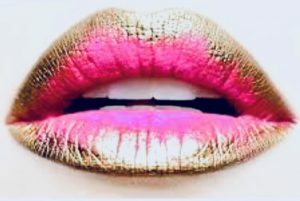 The entire premise of lipstick or rouge on the lips is to portray health dating back to the ancient Egyptians and Romans. They were some of the first to use plant pigments to enhance features to convey to the onlooker the presence of health, this is the aspect of beauty we are trying so desperately to capture. So what are we truly looking for at the end of the day is healthy color filled lips, no dryness or peeling, and just overall soft and subtle texture. The lips are an indication of metabolic health. We could break our bodies into which systems might be affected, however, the body is a whole unit working systematically to achieve homeostasis. And the lips give us clues to what is going on metabolically in our system. In Eastern holistic medicine, the lips convey the goings on within the intestinal tract. In Ayurveda, they indicate the level at which the body is receiving enough healthy fats and internal moisture. The cracked skin around the lip area can also be a lack of B vitamins. There is definitely a connection between hydration of the system as a whole and the appearance of the lip area. It’s interesting to point out that the lip area contains no melanin or sebaceous glands and that our own enzymes can be negatively impacting our lip area just by licking, not mention what it can do if it becomes habit forming. So how can we achieve inner balance? One of the best-known treatments for systemic dryness is the application of oils to the skin. This enhances immune function by stimulating the lymphatic system, it also introduces the plant’s immune system into the bloodstream through the olfactory system and bloodstream. We can take in healthy fats into our diet, use digestive herbs in cooking such a turmeric, black mustard seed, and cumin this assist the body in metabolizing nutrients properly. And we can stay properly hydrated with water, coconut water, and herbal teas. Then we have THE MINT lip treatment with the intention of treating this area with the same respect we do the other parts of our bodies, it’s a larger size because it is intended for multiple applications throughout the day, and I love peppermint for not only its skincare treatment but for its digestive elements. It’s cooling to this sensitive skin area. More importantly, this formula contains high levels of antioxidant oils well known for their ability to combat free radical damage and protect this area from oxidative stress created from environmental toxins. The truth is the lips are all alone in terms of being able to protect themselves compared to the rest of our skin. All of the natural defenses we have for our skin are non-existent on our lips so they require some help from our herbal allies. Keeping them hydrated with plant oils that give them the protection they need. I like rosehip seed oil by Co2 extraction the complete form of this Vit A powerhouse is just one of the beneficial ingredients contained in our lip treatment. In my opinion, a complete green skincare regime has to include rosehip seed oil, it is known to stimulate collagen production and is high in vitamin C.
The last thing we need to consider is just taking the time to care for ourselves and become aware of how our body operates, and try to mitigate aging badly. Aging happens and it’s okay but there are ways to do it right.